Funerals. Nobody likes to talk about them but sadly they are inevitable. It’s natural for people to want to avoid the subject of funerals. Making arrangements for funerals can be very stressful and traumatic. Funerals will always be a time of great sadness for the family and friends of the deceased. A funeral band can turn a funeral into a moving and memorable occasion. A jazz funeral is an opportunity to give a loved one a truly fitting send-off. 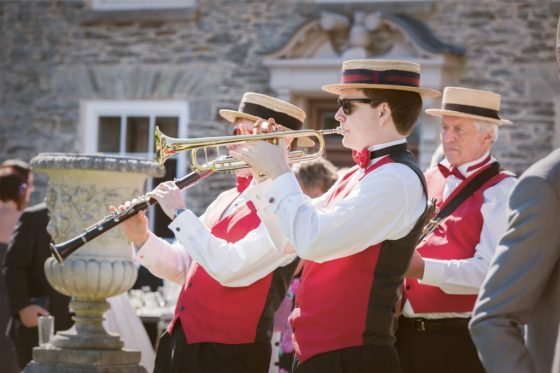 The Jazz Spivs and Silk Street Jazz are both available to hire as a jazz band for a funeral. Are you thinking of hiring a New Orleans funeral band or a band for a funeral procession? Silk Street has considerable experience in performing at funerals. We ensure that all wishes are met. Silk Street will work closely with family, friends and funeral directors to ensure that every last detail is covered. We will show compassion and sensitivity throughout. From the moment an initial enquiry is made to the end of the funeral itself, we will lend a sympathetic ear. The band led the funeral procession with ‘Birth of the Blues’ from the gates of the crematorium. This was in true processional style with a horse and cart. After the service, the band performed exit music as the guests reflected over flowers. A lot of time was spent on the phone taking to Sue and Dinah (daughter and wife of the deceased) to ensure that everything was organised exactly as requested. The family wanted the funeral to be very much a celebration of life. Again, this was very much a celebration of the life of the deceased rather than a traditional funeral. In true New Orleans processional style, the band met the cortege and led the procession down Wanstead High Street playing ‘When the Saints’. For the church service, the jazz band even took the place of the organist! They performed 3 upbeat hymns: ‘Go Tell It On The Mountain’, ‘Amazing Grace’ and ‘Down By The Riverside’. Of course, we understand that a funeral will be very emotional for all concerned. You can be assured that we will be sensitive and sympathetic throughout the whole booking process. The music that is played needs to reflect the importance of the day and be fitting for the occasion. All in all, we will do our bit in hopefully making the day more manageable. If we can lift the spirits of all who attend then our job is done. We cover the Greater London and North West regions, but are also available nationwide. Please do get in touch if you would like more information. You can contact us here: The Jazz Spivs. We can also cater for other funeral requests. For example, we have a trumpeter available for hire to play ‘The Last Post’ at the graveside.